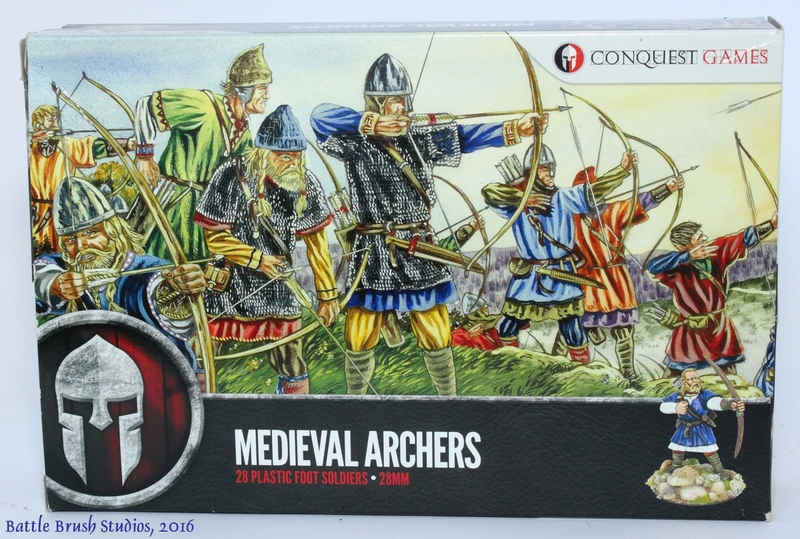 Hey-hey, today I will present some info, my opinion and insights on Conquest Games' most recent release - a set of 28mm plastic Medieval Archers. This release has been quite anticipated as up until this there wasn't really any plastic set which covered this area. 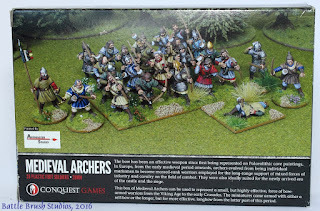 Gripping Beast's Dark Age Warriors didn't have any archers, Wargames Factory's Saxon Fyrd box had a few bows, but overall wasn't too well received and of course due to the sad demise of WGF are not available any more. Fireforge don't cover this particular subject either. Check it out, it's a very good article on British medieval archers. 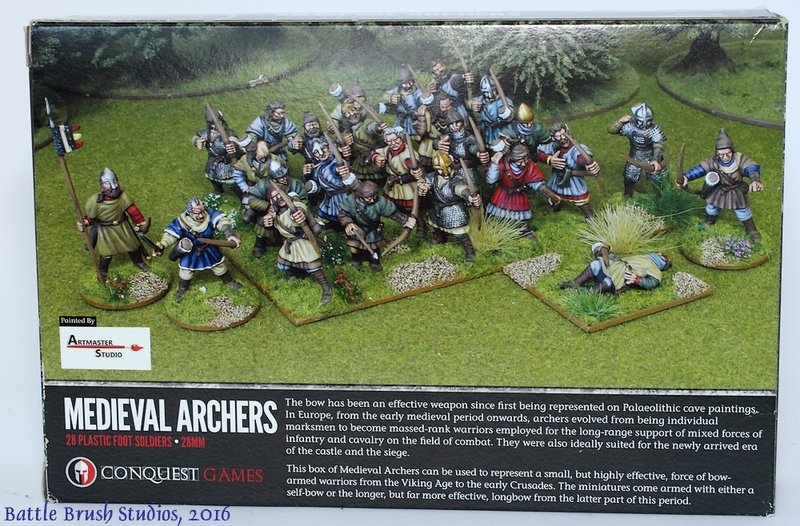 Of course these archers here fit with Conquest's other figures, so they mostly have a Norman appearance and indeed are medieval archers, so maybe a nudge late for Dark Age gaming, but they'll pass. I'm getting ahead of myself though, so let's do this by the book. 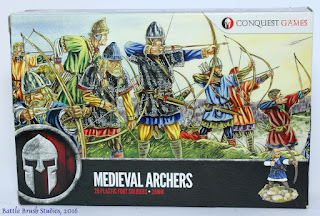 This my first review of Conquest Games models, so let's have a closer look at the box design first. They all got prominent artwork, which is something I really like. At closer inspection it looks a bit interesting in places. It's kind of rough in the way it is painted which doesn't make it appealing to everybody I'm sure (it's not Peter Dennis artwork), but it's bright and characteristic. I read critizim of their artwork, but I'd rather have this over artwork which looks like a computer game or just a photo of painted miniatures. That's strictly a matter of tastes though. Other than the artwork we got a picture of a fully painted miniature from the box, info on what's in the box (28 miniatures) some corporate design stuff, logo and all of that. I like the leather look-alike texturing on the black parts. In the back of the box we got a full box worth of miniatures painted in a nice, large photo along with artist's credits. What you will find in the box is pretty basic. No assembly instructions, no flag sheets or anything like that. Just the plastic sprues. There is the 'main sprue' of which you get 4 in the box containing 6 full archer models along with quivers, sheathed daggers, a choice of 12 heads and a choice of self-bows (short bows) or long bows. 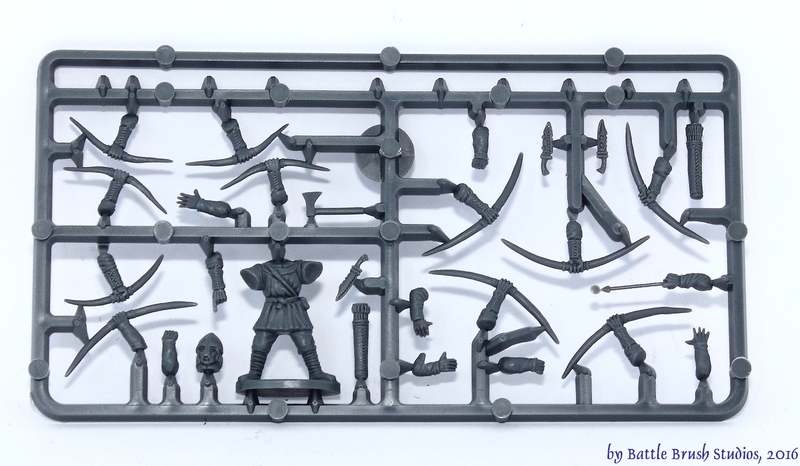 Just one bow short of getting the full choice of short or long on each of the archers on the sprue. 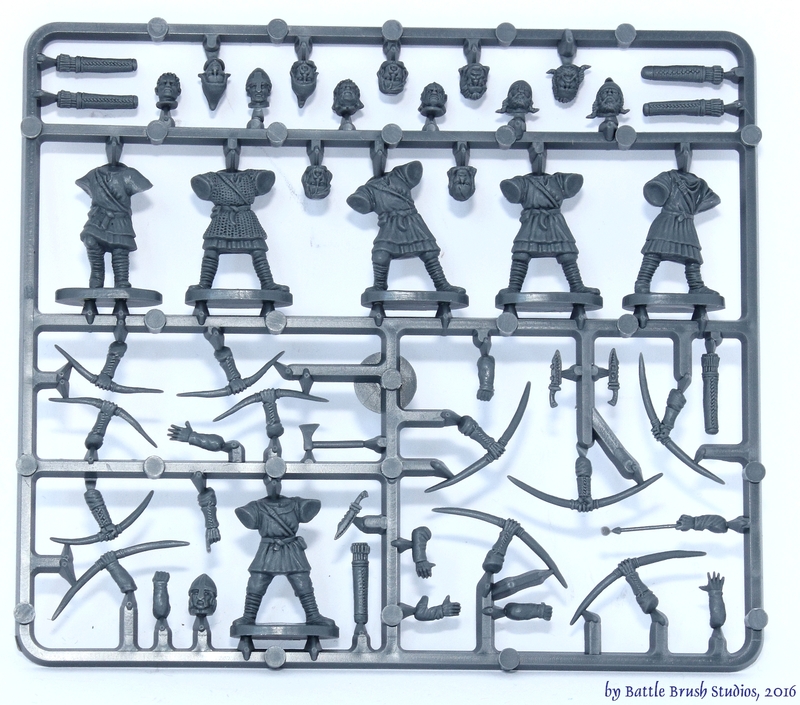 Each sprue has two heads wearing helmets and one torso wearing chainmail, the rest of the archers wear phrygian hats or just nothing on their heads. The rest of the torsos wear layers of tunics. The casting quality is really well done, without a doubt up there with other Renedra-cast plastics. Detail is sharp and crisp, no undercut problems or 'holes'. The usual amount of mold lines. All figures are standing up and can be ranked up on multi-bases without much problem. The stands they come on are pretty thick. If you feel like it you can file them down. If you mix them with say Gripping Beast plastics I would suggest doing so, otherwise the generally taller Conquest models will tower over their GB colleagues. 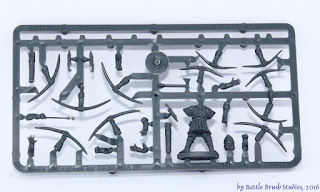 On top of that you also get a 'command sprue' which is the same as in Conquest Games' Norman Foot Soldiers box with two more bechainmail'd torsos, shields, an arm with a flag, a horn, a choice of arms holding swords and a casualty figure. Unfortunately I only have this picture as the photo I took suffered file damage for some reason. Taken from Conquest-games.co.uk. 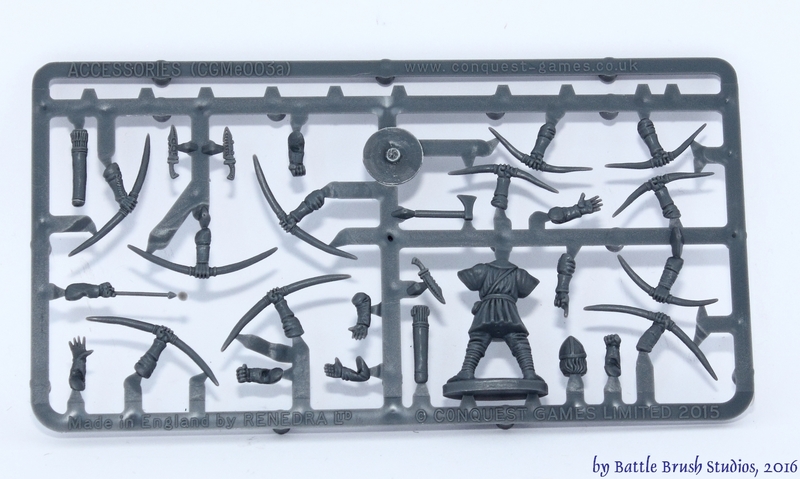 There's also a Renedra bases sprue in there. Usually they go straight into a box for later use I have to say. Assembling the models is as easy as with any plastic kit, but don't dive right in. These are archers and the amount of possible poses is to be found out first, so a fair amount of dry-fitting is advised so the poses look sound. On this build I used heads with helmets from Gripping Beast's Saxon Thegns box on six of the models so they look a bit more like Warriors rather than Levy in 'Saga' terms. You can identify those by the bits of green stuff between torso and heads as GB's heads don't come with necks and neither do the Conquest Games torsos. I also used long bows from this set rather than the most historically sound shorter ones as per customer's request. They were part of a Saga commission, On my own minis I might have done a few things differently. Otherwise it's really straightforward: remove mold lines, dry-fit, glue together, apply gap filler putty as required. I kept the painting fitting with the Dark Age rather than introducing heraldry (which is indeed possible with this kit if you aim for later time periods). I paint quite a lot of Dark Age figures and somehow it's always fun. It's like with Space Marines. There just are things I don't get sick of painting. People have been waiting for this kit for a long time and for a while Conquest Games' plastics had a reputation for being somewhat rough around the edges. I think that this was remedied with their cavalry at the latest. Either way, the long wait was worth it. 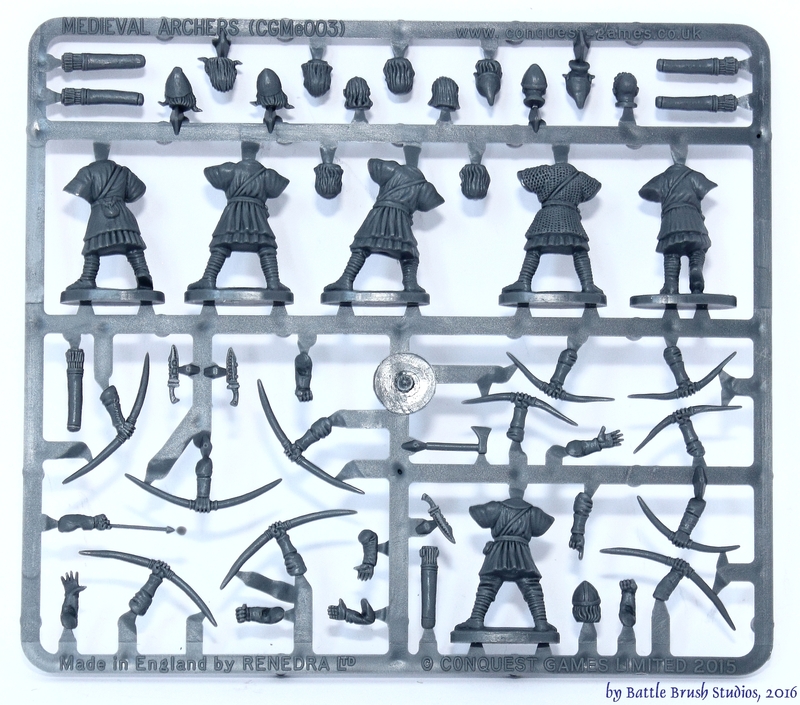 This kit is the answer to many people's laments for decent medieval archers in plastic. Solid, solid sculpts, interesting options and extra bits, good stuff. What did I not like about this kit? Well, it's not exactly cheap on a per-model basis. The box costs GBP 20.00 for 28 miniatures. However, Conquest Games offer the sprues from this box to buy separately off their website at a pretty good price compared to the full box. 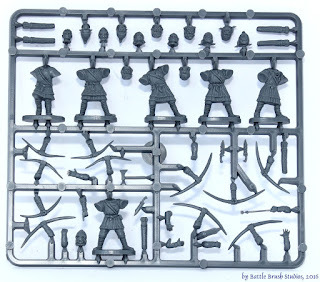 So if you require less than 28 archers you can get yourself one sprue of 6 full models for 4 quid. Which is nice for flexibility. The stands cast onto the models are really thick. I'm not sure why, but they either require some filing down or gap filling. Around them to connect the stands to the bases. Swords on Conquest Games' plastic sets are interesting, because they don't have edges. The blades have a square footprint. It's not a problem, just unusual. I hope that you enjoyed the review and that you can draw the infos you require out of it. I really like this kit, its such a great leap forward since their first kits. Thanks for this. I have never been convinced by Gripping Beast's rather squat plastics but these Conquest figures look very nice. Wonderful painting helps! The cavalry was their first set, so I'm not sure about that whole remedy thing. 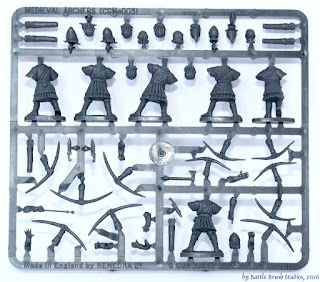 How do these compare in scale to Foundry ancients, especially their Vikings? Great review, Sigur! They have painted up really well, and there's clearly a good deal of flexibility in the figures straight out of the box. Thanks for the comparison shot with the Gripping Beast figures - they go together pretty well, I'd say. I am not a big fan of the models particularly but you make these look so good. Keep up the incredible work buddy! Its kinda funny that all the "dark age / medieval" companies all released archers in a very short time (like within a year or so of each other). Great minds think alike? or is this some Illuminati conspiracy! ?